Thankfully firefighters arrived just in time. One sneaky dog’s clandestine quest for a few bites of leftover breakfast food didn’t go exactly as planned. Rather than enjoy the sweet spoils unnoticed (as she no doubt had hoped), the pup inadvertently caused a near disaster. And now fire officials are hoping other pet owners will take note. The Southwick Fire Department in Massachusetts recently posted a video from a local homeowner who nearly lost everything on account of their dog's insatiable tummy. The family wasn't home at the time, but footage taken by a home security camera shows exactly what happened. 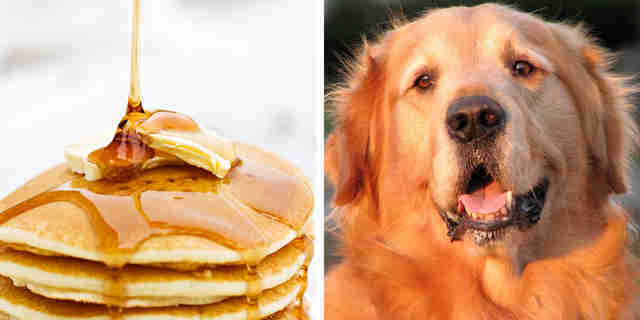 The dog is seen entering the kitchen before hopping up to nibble on pancakes that had been left on top of the stove. In so doing, however, the unwitting pup accidentally ignited one of the gas burners, sparking a fire. As the home begins to fill with smoke, the guilty dog and her canine companion try their best to play it cool. Luckily, the house was equipped with a monitored alarm system, so first responders were soon on the scene. Fire Department Chief Russell Anderson told The Dodo that the dogs were OK following the incident (and that their owners asked to remain anonymous). Anderson added that this is the only confirmed canine-caused blaze he's personally run across: "There have been fires where we suspected it over the years, [but] this is the first that allowed us to prove it." Of course, that's not to say it couldn't happen again. "If you have pets or young children in the home look into safety covers for your stove controls."